We had a lovely weekend at the Black Swan Inn in Tilton, NH over the weekend. I highly recommend it. 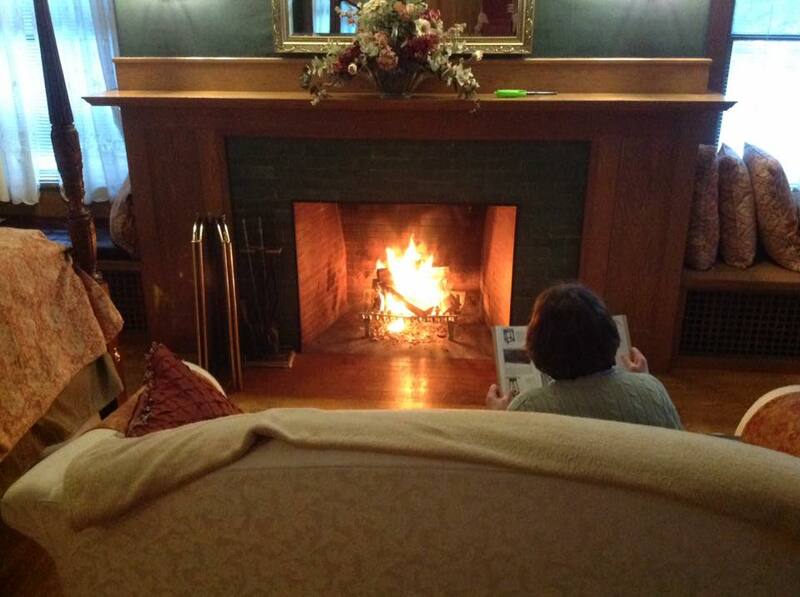 Our room had a lovely fireplace. The owners, Trish and John were extremely welcoming and the food was delicious. 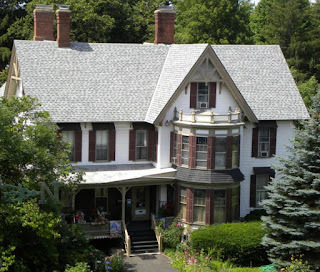 And, of course those of you in the Northeast know that just a few miles down the road in Center Harbor, there is a quaint little (wink) quilt shop called Keepsake Quilting. Believe it or not, this was all I purchased in this giant shop! There are two reasons for this. 1) I am planning on visiting Cyndi at the Busy Thimble this coming weekend and 2) I found something at an antique store that just had to come home with me. This wonderful tin display case that was actually still full of the dyes that they were selling. The backside is in better shape than the front, but it is in overall remarkable condition. I think I might want to keep thread in it as I’m sure the dyes are toxic. 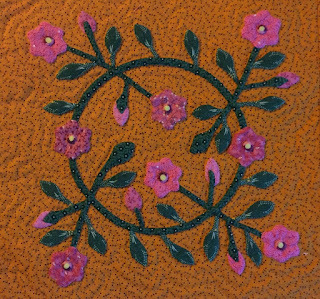 I brought applique to work on, but I forgot my Ottlight and the soft light of the room was not conducive to quilting. So, the next morning I went to the local hardware store and bought an LED flashlight with a hook to hang on my collar for $5.99 and stitched while waiting for my DH to wake up. They say that necessity is the mother of invention! I was not the only one in my local quilt group to finish my “Stars in a Time Warp”! My friend Betty Taylor (on the left) finished hers beautifully! Don’t you love how she put the stars out into the border? It doesn’t show well in the photo, but the sashing is a serpentine stripe. Perfect! Unfortunately, I left the meeting early the other night so I still have not seen this one in person. I will see it at our show this summer (right Betty?!!!). 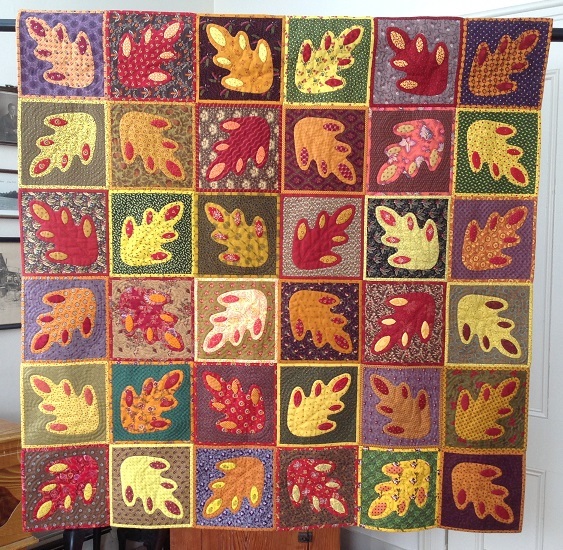 My friend Karen Mitman finished this beauty, quilted by Marcia O’Donnell of Albion, Maine. I just love it! And, after Karen saw Betty’s at the meeting she went home and whipped up this one with the striped sashing. I’ll update you as the top progresses. 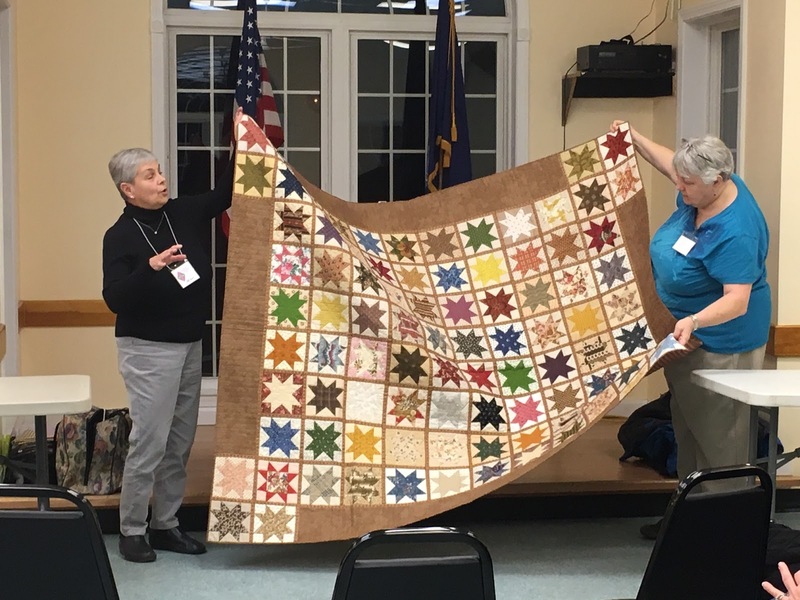 We had the first Quilt-a-thon of the year on Saturday. I was working on my log cabin Veteran’s quilt that I am doing as a sew-a-long with Bea and Cecile. Some of us worked very hard - right Kathy? - Just kidding! 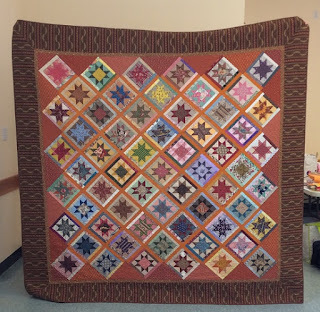 My friend Kathy Boudreau gets more quilting done than anyone I know! Quilt a little, talk a little, quilt a little, talk a little, eat, eat, eat, quilt a lot talk a little more. I’ll post more on my log cabin potholder when it is time to link up. I got about half of it done so I met my “log cabin goal” for this month and I will have another veteran’s quilt done for next month! Woohoo! We had two blocks to finish this month. I am assuming it is because we are (at least those of us in the northeast) usually snow bound and have plenty of time to quilt! Being a Maine native, I am rarely “snowbound” as I will drive in anything but freezing rain. That being said, there is nothing more pleasant to me than sitting with my hand work and watching the snow gently fall onto the trees outside my window. But, I digress. I had fun making these little blocks. I adore appliqueing circles, so doing the wreaths themselves was very enjoyable. As with most of the other SVBAQ blocks I backbasted these two. I fussy cut the leaves for the pink wreath and I was amazed at how some of them fit almost exactly where the outline was (others not so much, but no one will notice from the front). I was also amazed at how those tiny little yellow centers really make these red roses “pop”. They do seem naked without that center. this was the fabric I fussy cut to get those tiny centers. It feels good to have two done in one month. I am now looking down the homestretch. Although some of these have been challenging, I think I will be sad when they are all finished. But… probably not sad enough to make another any time soon. Wink! If you love applique I highly recommend purchasing this pattern. It was well done and you will be helping to support the museum. Once again, I do hope you will click on the link to the ShenandoahValley Botanical Album Quilt site to see all the wonderful variations. And a quick note to thank everyone for commenting on my last post. I hope that you all understood that it was not my intention to blame AQS or any of the major shows for the current trends. I simply wanted to encourage you ALL to show your quilts. I can't complain that their aren't enough of my type of quilts if I don't enter. I truly appreciate all the feedback! One of our groups in northern Maine is organizing a bus trip to the AQS show in Lancaster. I am in high hopes that we get enough participants to make if fly. If so, I certainly hope to meet up with a few of you there. Keeping my fingers crossed! Even though yellow is my favorite color, I am a true blue quilter. Not red with anger, not green with envy, but true blue! I enjoy every aspect of quilting from the shopping for fabric to the final finish. But one of my greatest pleasures is to be able to share what I make with other people. So, when I received my rejection letter from the AQS Lancaster show, I was disappointed not just for myself, but for the fact that it will not be seen and enjoyed by other quilters. I have posted (from my soapbox) before about the fact that you need to have a thick skin and learn how to take rejection if you are going to enter judged shows. But, Barb’s post (here) encouraged me to say it ONE MORE TIME. Get your quilts out there! Case in point, my friend was hesitant to enter her quilt. After MUCH encouragement, she did enter and was accepted. (I’m sorry I don’t have a picture to post, but will try to get one soon!) Now, every attendee gets to enjoy it! We as quilters want to see quilts. ALL quilts. I see a trend with some of the major shows that worries me. It seems that they gravitate toward what is popular and marketable. And, yes marketability is important to keep quilting alive. But, so is seeing ALL the quilts that are being made today. Not just what is trending. Thanks for listening. Enjoy the day and enter your quilts! It is with a heavy heart that we say goodbye to a giant in the quilt world. Sue lost her valiant battle with lung cancer on Sunday. 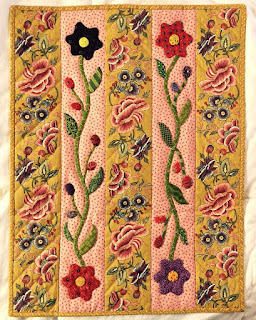 Sue was a talented quiltmaker, designer and teacher and never missed an opportunity to share her gifts. 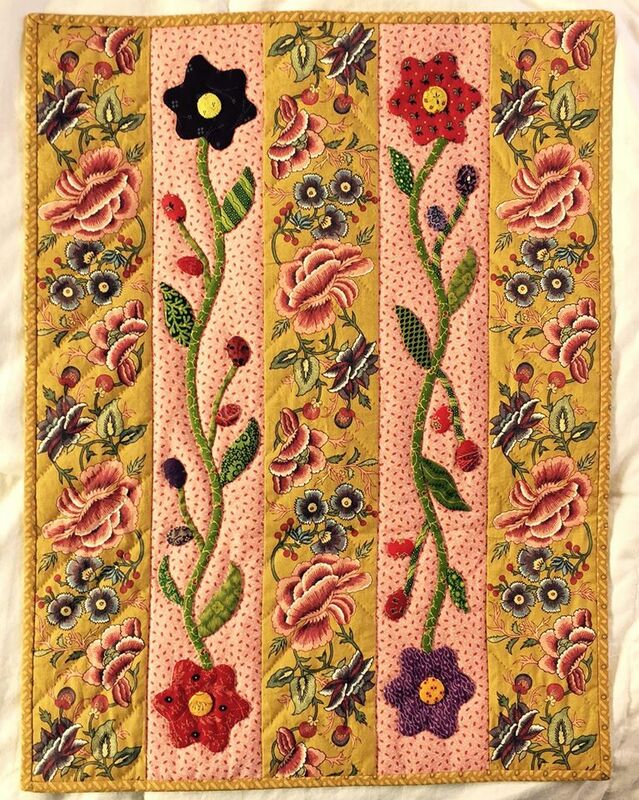 You may not know her by her face or even her name, but you will surely recognize the many quilts for which she was famous. Sue faithfully posted to her Blog on the first of every month. Her posts were always inspirational and she so enjoyed giving credit to fellow quiltmakers as she traveled through the quilting community. She was and always will be one of my idols! There is now a giant hole in the quilt world. 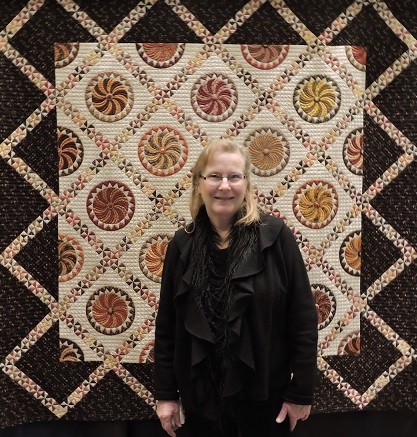 Please help to fill it by thinking of Sue today and take a moment to visit her Blog (Sue Garman) and pay tribute to this quilting treasure. First of all, I would like to thank everyone who took the time to comment or e-mail me regarding yesterday’s post. I sometimes think I am the only one who lives in a rural area. Many of you lamented that you have no “local” quilt shop. I can easily forget how lucky I am that Cyndi is only 45 minutes from my house. Actually, if she were any closer I’d have to re-mortgage! On to the “Pot Luck” saga… Many people have commented on the fact that the math for a layout like this would be overwhelming. So, here’s the skinny. I do like basic mathematics and geometry, but I am lazy and I’m always looking for the easy way out. So… when I did the figuring for the overall layout I used a ¼” graph paper and just used the factor of 2 ½” for each grid. Thus, every block is divisible by 2 ½”. I mentioned previously that I had a lot of orphan blocks (or at least I thought I did), and I also wanted the quilt to be scrappy and interesting so I needed at least 40 blocks. Here is the final draft of 44 blocks. Along with the dozens of potholder quilts I have made utilizing square blocks (ranging from 3” to 16”), I have also learned to do scalloped shaped blocks and have even made one in the medallion style. So, I wanted to see if I could make a mish-mash of block sizes with some half square triangle blocks thrown in too. I'm also mixing hand and machine quilting which is another learning experience. I learned that the triangle blocks are fine as long as I am extremely accurate with my outside measurement. I was pleasantly amazed when the finished block measured exactly what I had intended. I rarely use solids, but I do think this red binding fabric really ties it all together. I have learned a lot about putting these potholder blocks together. One very important item is when stitching your blocks together, if one is slightly longer than the other, always have the longer one facing you. It might be the way I stitch, but for some reason the block on the outer side shrinks as the one closest to me stretches. Therefore, if the longer one is in front, it will work its way even in the end. Have I confused you yet? It is also important to have very "crisp" and pointed corners. If they are even slightly rounded, you will have a gap where your corners come together. Some of you have asked what stitch I use to put them together. I call it a modified ladder stitch. I simply start at the corners by hiding my knot, then going straight across. I then turn my needle parallel with the binding and come straight back again. It is a combination of a ladder stitch and a regular whip stitch and it hides my stitches better and is quite sturdy. If I am going to use the quilt on a bed rather than just a display quilt, I will take a few extra overcast stitches every 1 ½” or so. This way if a seam ever starts to ravel, I only need to fix a small portion. I learned this the hard way when I gave one to my grandson! I am using cheater prints on the back of each block and they hide a multitude of quilting sins. In fact, except for the hand quilted blocks, you really want to admire this one from afar. It looks pretty good through the camera lens or from the house next door! I am having loads of fun though and may even get it done before the daffodils arrive! Pam Buda posted (here) about something near and dear to my heart. I often find myself spouting off to students and friends to support their local quilt shop. How many of you have lost a wonderful quilt shop to the ravages of the internet and/or discount fabric houses? Don’t get me wrong. I like a good bargain as much as the next person. And, there is a place for both the large and the small. However, if we spend all our designated quilt funds on the “best deals in town”, there will be nothing left for that little neighborhood shop. The one that helps you out when you need advice. The one that will bend over backwards to get you a piece of fabric that you just have to match and has long ago been discontinued. The one who is always happy to see you. This is a stack of Pam Buda's "Old Plums" at Busy Thimble. - YUM! I have mentioned before on my Blog how lucky I am to have a very good friend (Cyndi) who happens to own the best quilt shop ever! Grab a cup of tea and head over to her Blog (BusyThimble) and scroll through the years of wonderful posts. Your head will be spinning from all the inspiration! I should add that by local I mean 35 miles from my house! There are a lot of us still living in rural communities, where local means anywhere within a 50 mile radius. So, what is your favorite shop? I’d love to hear about it. Look what the mailman delivered to me on Saturday. Wonderful “leftover” blocks from Randy (Barrister’sBlock). These will make great blocks for upcoming Veteran’s quilts. Thanks Randy! I did get in a little “Pot Luck” time over the weekend and will post my progress soon. What do you do with your leftover blocks? My first (by saying first, I am in no way implying that there will be more!) sew-a-long this year are log cabin blocks. Cecile (Patchwork Inspirations) and Bea (A Needle in a Haystack) are the hosts. Cecile with be posting the traditional blocks and Bea will take on the innovative ones. I have decided to make a veteran’s quilt so I have chosen red, white and blue fabrics. I am going to make it in the potholder style (surprise, surprise), but am going to try a new technique. I am making 2” finished logs, so I start with a 2 ½” square directly in the center and then add my strips in a quilt as you go technique. It will need a little careful trimming before I bring the back around! I cut my batting the exact size of the finished block, in this case 10 1/2". Then I will bring my back around to the front and make 20 “finished” potholder blocks. The new technique will be how I attach them together. I’m still working on that so stay tuned. I accepted this challenge because we are only expected to make two blocks a week. I can do that, right? Do check out the link on both Blogs at the end of the month. Thanks Bea and Cecile for the inspiration! Many of you have embarked on an ambitious endeavor to complete 17 UFO’s for 2017 hosted by Pomegranate andChintz. I gave this one a lot of thought, but decided I’d have a lot more fun watching all my Blogging friends feel good about their accomplishments. I am much too nice a person to steal anyone’s glory! 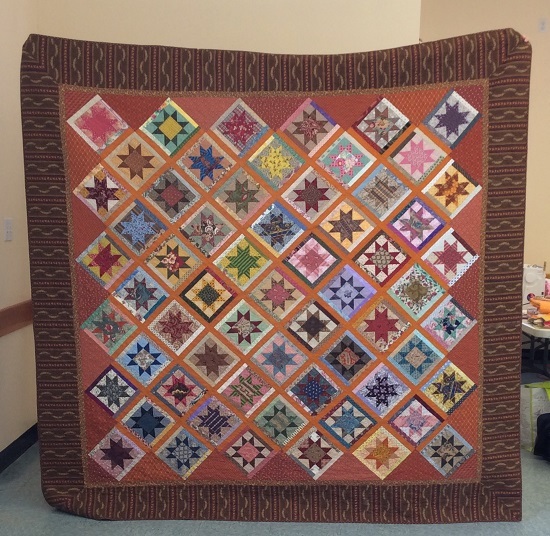 Many of my Blogging friends have posted this week about all the quilts they made in 2016. I thought about this one too, but decided that I was way too lazy it would take away too much of my quilting time to go back and grab photos of what I finished last year. So, I invite you to scroll through my past posts if you are so inclined. All kidding aside, I do hope you will take some time and scroll through your favorite Blogs to see how much we do accomplish in our little quilt world. We have a lot to be thankful for in our little community. We make quilts for those in need. We lend support to fellow quilters and advice when needed wanted. But, most of all (at least for me) we relive the stress of everyday life from our aching shoulders by simply picking up a needle and thread. My list of ongoing quilts to make is far too long to finish in one year, but I have crossed off a few. Of course, for every one of my 39 (yes 39) quilts on the list I eliminate, I add at least one more! Now, that is only 6 out of a list of 39. I know there will be many more than this, but since I am such a creative flea, I just don’t know which one I will “jump” to next. Tune in next January to see how I did!